Home / Alien / Alien-1979 / Batman / HowTo / Robocop / series_A-Z / SpiderMan / StarWars / Superhero / Transformers / P - Are These The Toughest Paper Dolls Ever Made? 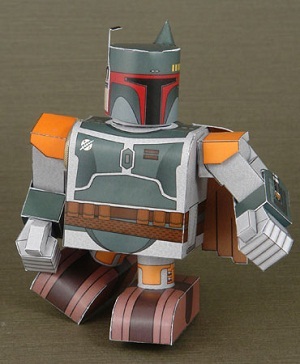 P - Are These The Toughest Paper Dolls Ever Made? 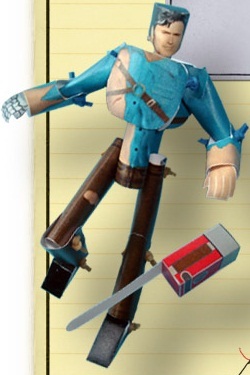 Children have been playing with paper dolls for hundreds of years, but these 3-D paper dolls will crush all in their path using flamethrowers, chainsaws and machine guns. Grab a sharp pair of scissors, a glue stick and make some of the toughest papercraft models in the universe. 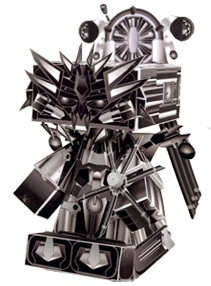 I first ran across Shunichi Makino's SF work when I was looking for a good picture for the Jango Fett post. I was amazed at his intricate paper designs. Here, the ultimate bounty hunter Boba Fett is ready to lay waste to the "Raggedy Ann" paper doll next to him. 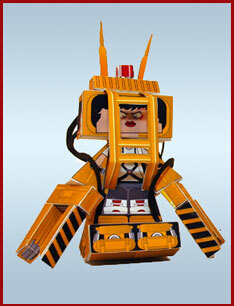 When Ripley faced off against a giant alien queen with snapping jaws and acid blood, she took her out with this powerloader construction suit. Brian Castlefort did a great job. I like the expression on her face as she yells, "Get away from her you b%@#h!" 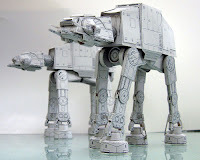 Another work by shows the fearsome AT-ATs from Star Wars lumbering to take out the "Dolly Dressup" dolls lying nearby. They can't resist power of that magnitude. 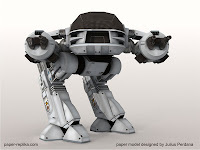 Julius Perdana has made an amazingly rendered model of Robocop's nemesis ED-209. This one is amazingly detailed and would probably take you months to make it right. In the near future of Detroit, Michigan Robocop was supposed to be the ultimate policeman. A cyborg with the power and emotionless to enforce the law. Unfortunately, they didn't wait for a volunteer and transformed an honest cop into a a walking tank with a badge. 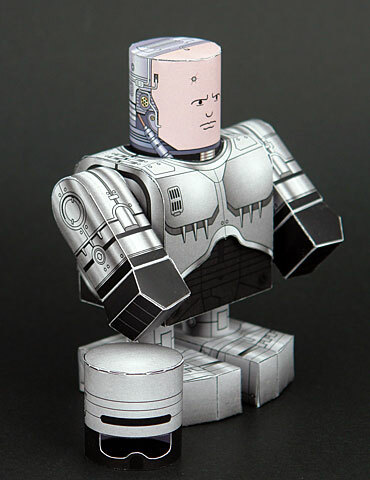 Shunichi Makino's even comes with a helmet to cover up the bullethole in his forehead. That's detail. 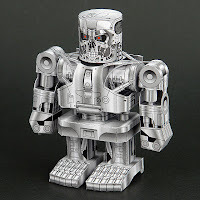 I love how Shunichi Makino's model of the invincible Terminator T-800 from the Terminator series has interchangeable heads! 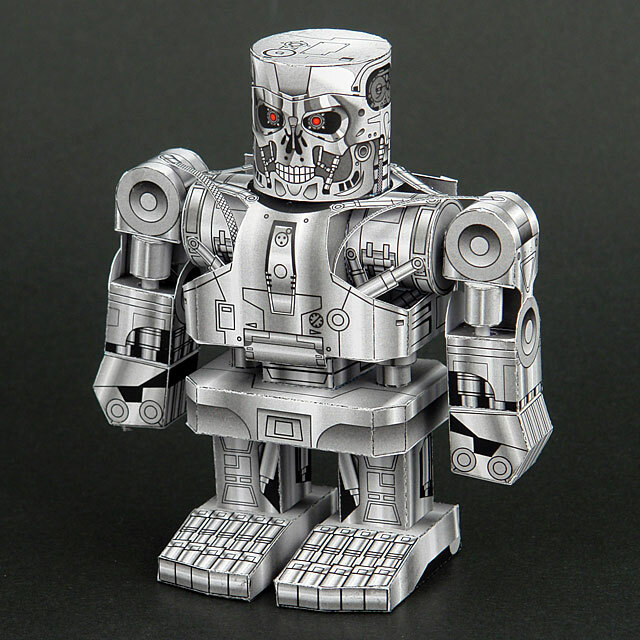 You can make one with the Arnold wearing sunglasses, just scowling or his endoskelaton head. If you make it, he'll be back. From the Marvel Comics Universe comes the psychotic Spider-Man villain "Carnage." IGN's 90th Greatest Comic Book Villain of All Time. Danyel Saldanha has created one of the most terrifying papercraft creations ever. I just think the guy is creepy anyway. Somehow he's creepier as a doll. If you doubt that, keep in mind that the red coloring in his costume is made of blood. Bruce Cambell got his start in the series of low budget horror movies Evil Dead as the witless Ash Williams. If one of those freaky paper dolls even touches him, he'll take 'em out with his paper chainsaw. The ultimate in scary villains was Christopher Nolan's Joker from The Dark Knight. Esscoh's model is different from the others. You can actually dress him up in different costumes from the movie. You'll never be too serious making this doll. Remember sLaughter is the best medicine. If you decide to make one, we'd love to see it. We'll even make up a gallery of the best ones. Send them to geektwins at gmail.com. Which is the tougest paper doll in the list? Do you feel tough enough to make one and share your creation? This post is "P is for Papercraft," part of the "A-Z Blogging Challenge." We'll be posting something on our blog every day in April except for Sundays. The challenge is hosted by Arlee Bird , Jeffrey Beesler, Alex J. Cavanaugh, Jen Daiker, Candace Ganger, Karen J Gowen, Talli Roland and Stephen Tremp. Visit them today and every day for the next month! 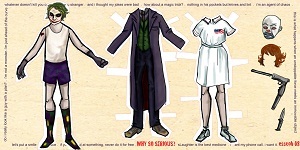 Other than the Joker, can you even really call these creations "paper dolls". They are pretty incredible. I can make a paper airplane or wad up a ball of paper to throw in the trash, but I'm not sure I'd have the patience or creativity to make something like these.